Featuring Humanscale's weight-sensitive, mechanism-free recline, Smart automatically adjusts to the body weight of each sitter to provide perfect recline support. Using the laws of physics, all the user has to do is sit and the chair will provide the correct amount of tension for their shape. Free of manual controls, Diffrient Smart has a striking, sleek aesthetic, and its U-shaped back makes it the perfect fit for any high-design environment. 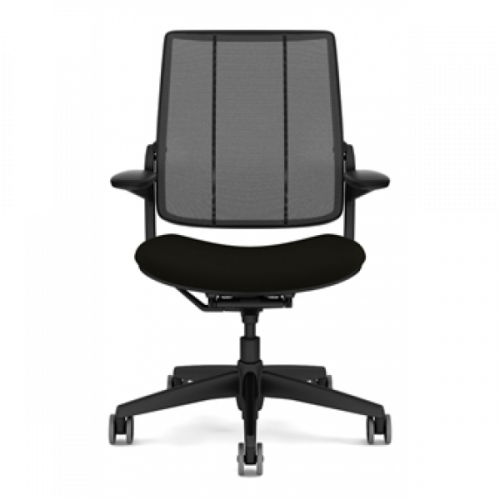 With linear lines in the backrest and strong mesh for maximum support, it's the ideal task chair for the modern, active workspace. "As a result of seeking a really good adjustable arm, I was led in a direction that would allow me to do that in the best mechanical and serviceable way. That led me to the dominant visual feature of the chair... the horseshoe shaped aluminum support." Following the success of Liberty and Diffrient World, Niels Diffrient developed Diffrient Smart to offer a chair with strong visual features. He wanted to create a task chair that was in line with Humanscale’s philosophy of designing seating that is simple, beautiful and effortless to use. Diffrient Smart has straight, bold lines and a timeless horseshoe-shaped aluminum support, so its suit any environment it is placed in. I have been looking for an ergonomic chair for some time. I have had Herman Miller most of my professional life. I was introduced to the Diffrient Smart task chair and fell in love with the colors. It is a great chair and makes my office stunning.